It’s beginning to look a lot like… Christmas camping! It’s every kid (and kid-at-heart’s) favourite time of the year…and every parent’s nightmare. Christmas is fast approaching! This means organising who-gets-what, making sure the kiddies meet Santa while he’s visiting, and the inevitable mad dash to the shops because someone forgot to buy bonbons. However, the holiday season doesn’t have to be stressful for you! Christmas camping is easily one of the most popular traditions for Australian families. Avoid the awkward discussions over which in-law’s turn it is for Christmas lunch. Bundle the kids, their toys, and the esky (all essential things) into the car and enjoy a relaxing camping holiday away! So without further ado, here are our all-time favourite places to go Christmas camping. Unless you’ve been living under a rock, you’ll know about Cairns Coconut. This fun-filled family oasis is situated among 28 acres of a luscious, vibrant rainforest. Talk about a tropical paradise! Holidaying in Cairns during summer will be quite hot, but don’t let that stop you. 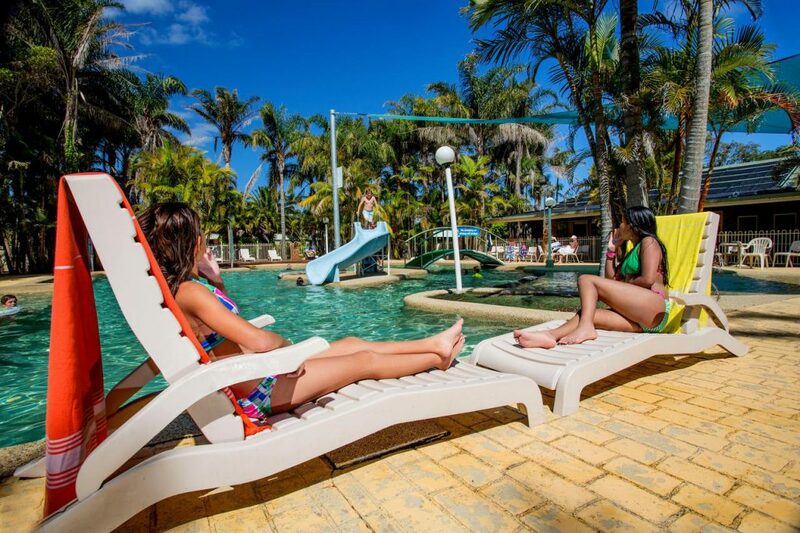 At Cairns Coconut you can escape the heat and splash in the resort’s water park, take a dip in the cold spa, or practice your snorkelling before you explore the reef. You won’t run out of things to do in Cairns either. There’s the Daintree rainforest for you to explore with the family. See if you can spot the rare tree-dwelling kangaroo! The Kuranda sky rail is another iconic tourist attraction allowing you to experience breathtaking views of the region on your journey to the unique village. Finally (of course), you’ll find the Great Barrier Reef just a hop, skip and jump away from Cairns Coconut. This is a must-do for any visitor to the region! Do you like the idea of a coastal holiday in Queensland, but want something a little cooler than the tropical Cairns climate? Look no further than Rivershore Resort on the charming Sunshine Coast! With glamping tents galore, onsite Driftwood restaurant and a refreshing on-site bar, this is a holiday destination parents will love! Spend your Christmas holidays cooling off in the waters of the nearby Mooloolaba beach. We recommend you grab some fish and chips from the Mooloolaba Fish Market while you’re there. Head to the Maroochy River to try your hand at catching the fish of the day or hire a paddleboat for a relaxing ride down the river. Take a day trip to the Sunshine Coast hinterland and explore the quintessential old-English style village at Montville. Alternately, you could take a dip in the nearby Kondalilla Falls at Flaxton. This is the perfect Christmas camping location if you love the outdoors! You may have sensed a pattern forming here – Aussies just love beach camping at Christmas time! With the scorching heat during our summer months, it would be crazy not to holiday near the seaside. Cooling off in the water is essential! This family-friendly caravan park features a swimming pool and spa, tennis court, playground, mini-golf and a jumping cushion – your kids won’t want to leave! Ingenia Holidays One Mile Beach is the best place to stay if you want to try something memorable, possibly even outside of your comfort zone! One of the most popular tourist attractions in the area is the Oakfield Ranch Camel Ride at Anna Bay, where you can ride tame camels across the foreshore at sunset. If you’re brave, consider visiting Irukandji Shark and Ray Encounters to get up close and personal over 190 shark species! However, if that’s not up your alley, there are plenty of other activities to do. Go sand boarding, take surf lessons, or a visit to the Hunter’s Botanic Gardens. For those seeking a Christmas camping holiday where you’ll experience something out of the ordinary, then look no further than Ingenia Holidays One Mile Beach! There’s no doubt that Aussies love their Christmas camping! These are just a few of our favourites. If you have a go-to Christmas camping spot, we’d love for you to share in the comments below! For more information on parks, visit Campstay to browse and book your Christmas accommodation now! Do you need a little help planning your next holiday? Campstay can help you find, compare and book holiday parks and campgrounds. Check out our website here, or download our android / itunes app. You can also follow us on Facebook, Instagram, or join our group – Holiday Park recommendations Australia. Its beginning to look a lot like Christmas camping! – Campstay Blog – Campervanfans on It’s beginning to look a lot like… Christmas camping! Become one of our very first subscribers. You'll be rewarded with unique perks and the opportunity to shape Campstay's future.